We’ve just released a bunch of improvements for Littledata software to improve your data analysis and reporting. Grab yourself a cuppa and read on to learn what’s new, including the ability to choose which reports you want to get, updated spam filter, and more. We want to give you more control over your subscription so we’ve added further customisation options to your settings. You can now update your subscription name to be something more descriptive than the default property name we select. If you have multiple views for the same website or a very long property name, you can change the name to something more snappy and understandable. So far you’ve been getting a set of standard reports without being able to pick which reports are important for you. That’s changing! You can now select the metrics and segments you care about and want to get reports on, and turn off the ones you don’t. You can do this by going to your subscription settings, and updating the Metrics & Segments sections. We believe that analytics reporting should be simple, clear and unpolluted with unnecessary details so we’ve made your reports easier to understand. With a lot of changes to the website traffic, the interface can get quite busy with numerous reports trying to get your attention. We made the titles much simpler by focussing on the main change that the reports are about, thus allowing you to skim your reports and see what’s happened more quickly. 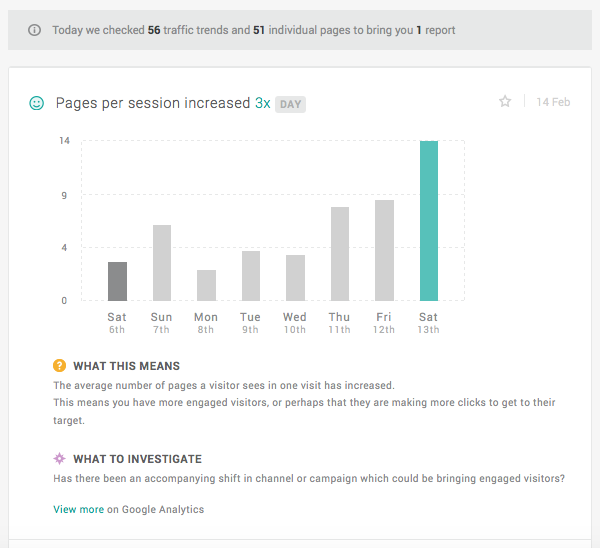 Our trends reports look currently for daily and weekly changes in your website traffic, and previously you had to rely on the report title to see which time comparison the specific report is for. To make it clearer, we have taken this information out of the titles and added time tags instead. Now you can quickly see which reports are daily or weekly comparisons. I have previously written a guide on how to remove spam referrals and I know from experience it can be time consuming and frustrating to set up. You have to identify these spammers in your data first, then check other more common ones to add to the list, write a regular expression, then create one filter, then another and so on. Did I say it can be frustrating? Our spam correction feature takes the exasperation out of this process by adding filters to your analytics view once you authorise the fix. Whilst we’ve had this feature for some time now and it’s as popular as ever, we have updated the list with many more spam referrals. We’ll send you a tip report if we find fake referrals in your traffic, and you can clean up your data by clicking on ‘Fix this now’. Feel free to ask questions or send us your comments either below or via the Intercom Messenger available when you’re logged in.